Rafalca, the equestrian Olympian, explained. Got more questions? Send ’em our way. At 15, Rafalca is older than a lot of Olympic gymnasts, but roughly average for a world-class dressage horse (although they’re broken in at a young age). She’s an Oldenburg mare, historically bred for military and carriage work, and now used for jumping and showing. You can get one for as little as $7,500, though it probably won’t make the Olympics. 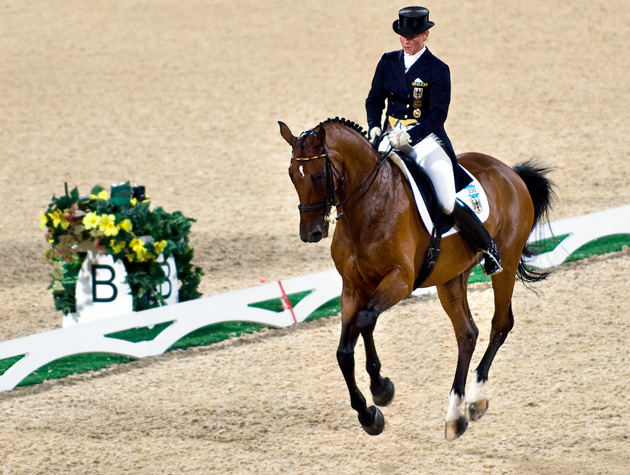 Thursday and Friday, Aug. 2 and 3, when the “Grand Prix” individual dressage competition kicks off. The BBC has up-to-date coverage here. That’s a far cry from the sport’s martial beginnings, designed to keep war horses in top shape for combat. Prior to the Helsinki Olympics in 1952, competitive dressage was an exclusively military event, performed by all-male uniformed cavalry officers (and, of course, their trusty steeds). So, this is another rich-people deal, right? Participating in dressage isn’t cheap; the New York Times describes it as “a sport of six-figure horses and $1,000 saddles.” Ann and Mitt Romney, who are technically co-owners of Rafalca (and three other dressage horses), took a $77,000 loss on their 2010 taxes for Rafalca’s care, though they didn’t deduct that entire amount… yet. It’s a complicated case, which is par for the course when your tax return is 203 pages long. Is this just an expensive hobby for Ann Romney? Wait: Horse-riding therapy is really a thing? Yes. Experts call it hippotherapy—not because the horse or the rider is fat, but because “hippo” is the Greek root for “horse.” (Incidentally, hippopotamuses are “river horses,” though it’s probably best not to try breaking one in with a saddle.) In 1952, the first year civilians were allowed to enter horse events at the Olympics, the silver medal in dressage went to Denmark’s Lis Hartel, a polio victim who needed help getting on and off the horse and credited the sport with restoring her mobility. physical abilities are concerned,” one article warns. Does Rafalca have a future in politics? Maybe. When the Democratic National Committee released two web ads starring Rafalca and her twinkle-toes, titled “Mitt: Dancing Around the Issues” (see one of them below), conservatives charged Democrats with making light of Ann Romney’s health issues, and the DNC quickly apologized. “We have no plans to invoke the horse any further, to avoid misinterpretation,” a Democratic spokesman said. But that hasn’t stopped progressive soft money groups from making the mare an issue: Both MoveOn.Org and the labor super PAC Workers’ Voice have said they’ll use the horse in anti-Romney ads. 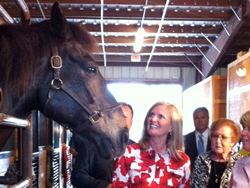 What kind of a track record do the Romneys have with animals? Not as good as Newt Gingrich. You’ve heard of Seamus the Irish setter, right? How about Marco Polo the horse? What are Rafalca’s chances of medaling in London? Don’t bet on it just yet. She got there with a third place showing in this year’s United States Equestrian Federation National Dressage Championships, but she may be no match for this gay Dutchman (or his former steed, who’s famed for having “the most wanted sperm in horse breeding“). Is Rafalca stealing jobs from American workers? How did Rafalca get to London? By Fedex air, according to the mare’s rider, Jan Ebeling. Despite persistent rumors, we’re almost certain she didn’t get there like this. Am I un-American if I don’t root for Rafalca? According to the New Yorker, yes. Okay, but seriously: a rich people thing, right? Making hay: courtesy Current TVCan I connect with Rafalca on the interwebs? If you’re not a big supporter of Mitt Romney’s presidential aspirations, you’ll probably enjoy @RafalcaRomney’s fake accounts on Twitter and Tumblr. You can find more serious updates on rider Jan Ebeling’s Twitter feed.